Settled in the 1800s, the town of Bramwell, West Virginia is located eight miles north of Bluefield,West Virginia, adjacent to Route 52. Bramwell is seated 2300 feet above sea level in Mercer County, West Virginia. The Bluestone River surrounds the town in a horseshoe bend fashion and it was first known as Horse Shoe Bend in the early 1800s. The Town's namesake, J.H. Bramwell was a New York civil engineer. J. H. Bramwell was Bramwell's first post master. He was a Flat Top Company local superintendent. After getting rich on real estate sales in Bramwell he left the town for Switzerland where he died in the 1890s. The town of Bramwell was incorporated in 1888 under a special charter granted by the Circuit Court of Mercer County with John D. Hewitt, Senior named as the first mayor. In 1873 the extensive West Virginia coal fields started in Bramwell and extended over forty miles. Bramwell's wealth was supported by the Pocahontas coalfields, which employed 100,000 miners. At one time, the Norfolk & Western railroad had 14 trains a day stopping in Bramwell. The Historic Bank of Bramwell was the financial center of southern West Virginia. It was thought to be the wealthiest bank per capita in the country. The bank's janitor, Henry Wade regularly transported leather bags filled with money by wheelbarrow down the brick paved streets to the nearby train depot. The depression that began in 1929 brought and end to the Bramwell Bank. In 1886 the Pocahontas Coal Company was formed to act as the railroad’s marketing arm for the coal fields. The offices were located in Bramwell. By 1896 the town had a population of 4,000 and by 1897 the N&W had completed lines into McDowell County. Mining activity expanded rapidly. By 1895 there were thirty-eight mines in the Flat Top field. Bramwell quickly became the center of commerce and finance for the coal mines in the Flat Top field. The Bank of Bramwell was formed in 1889 by James Mann and his cousin, I.T. Mann established as its cashier. Mann, at one time, controlled all of the lands of the Flat Top Coal Land Association, which he in turn sold to the N&W Railroad at a handsome profit. At one time there were seventeen millionaires in the town of Bramwell. Bramwell is best known for having the largest number of millionaires per capita of any town in America in the late 1800s. Bramwell once had as many as thirteen millionaires living there at one time in the early 20th century. The magnificent homes that remain there today testify to this wealth . A detailed history of this historic town can be found in a book authored by Martha Jane (Williams) Becker in 1988. This book "Bramwell -The Diary of a Millionaire Coal Town" is based on material written and published from time to time by Dwight W. McCormick . The book draws from research by Mr. McCormick and his Bramwell High School Student American Government Classes for over thirty years. This excellent research material accurately depicts the "first one hundred years" history of Bramwell, West Virginia. Here is a little known fact - Bramwell was at one time the only town of it's size in the U.S. to have three post offices within the town limits (Bramwell, Freeman, Cooper). The Office of the Postmasters' General in Washington D. C. records show that the first postmaster in Bramwell was Joseph H. Bramwell and he started this job when the Bramwell Post Office opened on August 14, 1883. When the famed Bank of Bramwell was incorporated in 1889 Joseph H. Bramwell was then installed as the bank's first president on May 1, 1889. Bramwell's namesake, Joseph H. Bramwell, an engineer from Staunton, Va., who accompanied Captain I. A. Welch on his 1873 survey of the Pocahontas Coalfields. Bramwell later worked as general manager of the Crozier Coal and Coke Company. Official Post Office records record that Joseph H. Bramwell was the first postmaster in Bramwell, serving from August 14, 1883 until May 1886. 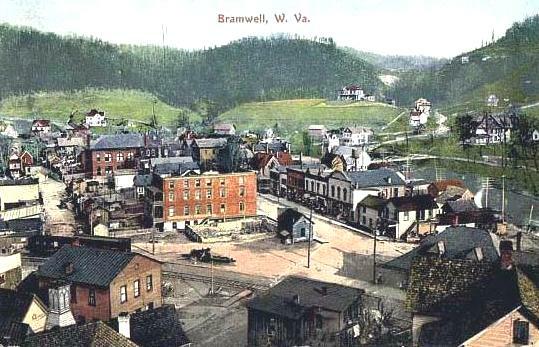 This era 1900 postcard shows an early view of Historic Bramwell, West Virginia. The photograph shows the downtown main street, many houses and buildings, N&W train cars, and the surrounding mountains. The card has a Bramwell cancellation of Aug. 10, 1909, and is addressed to Harriet Maynard, North Franklin, CT, from SMF who says there is an X over their house. 1882: The start of mining semi-bituminous coal in Pocahontas, Virginia. Phocahontas is only a couple miles from Bramwell, West Virginia. Thousands of laborers came from the U. S. and abroad to work in the many mines surrounding Bramwell. 1883: New York civil engineer, Joseph H. Bramwell arrived the community that he later named "Bramwell". joseph Bramwell was appointed the first post master of Bramwell. His now famous line was "Every little baby has a name, and this little town must have the same. I therefore name it Bramwell." Joseph Bramwell also became President of historic Bank of Bramwell. 1884: The first rail system was completed the Town of Bramwell. This significant achievement made it possible for coal to be shipped from the local mines throughout the country and to sea ports like Norfork, VA; where the coal was loaded on ships such as the I.T. Mann ship in the 1920s. 1884: Coal Baron John Cooper operated the first coal mine on the West Virginia side of the Flat-Top Coalfields near Bramwell. John Cooper's mine in Cooper section of Bramwell shipped his first coal from W. Virginia's valuable Pocahontas Coalfield over N&W Rail Road on Nov. 4, 1884. 1885: Bramwell was settled by the Flat Top Coal Land Association. This association was known to be the largest holder of potential coal fields in the area. 1886: The building of the historic Bluestone Inn in what was to become the Town of Bramwell two years later. This Inn survived the great 1910 Bramwell fire. However, it closed it's doors shortly after the start of the depression around 1929. 1887: Dr. H. V. McNeer's house that some some town residents claim to be the oldest house in the town of Bramwell was built. Research indicates that on January 30, 1899 he sold the house to his daughter, Bessie McNeer O'Neal for $1.00. 1888: The Town of Bramwell that was name by Joseph. H. Bramwell was founded. 1889: The Bank of Bramwell was chartered. It became known as the richest bank in America. 1890: Isaac T. Mann came to Bramwell. Mann lived on Main Street in Bramwell with his wife and 2 children for 32 years. He was one of the wealthist and most powerful man in the coalfields and was involved in the establishment of the Bank of Bramwell. It is said that by the late 1920’s, Mann was worth exceeded $80 million dollars. He lost his fortune at the fall of the economy in 1929. 1890: The Bramwell Presbyterian Church was organized by Issac T. Mann. The church was constructed of local bluestone and finished construction in 1903. It was paid for by Mr. Mann. The first service was held in 1904 and remains a active church today. 1893: The Bank of Bramwell was finally built. Under isaac T. Mann's leadership it is known to have financed many projects outside of the Town of Bramwell, including the Burning Tree Country Club in Washington, DC and commercial buildings in Chicago, Illinois. 1893: The Bramwell Masonic Lodge established an official home when the Masonic Temple was constructed. Several offices, including Pocahontas Company, were housed in this building. 1895: Phillip Goodwill, general manager of Goodwill Coal & Coke Company, built his Victorian home on a hill overlooking the Bluestone River. This home includes a ballroom on the third floor that was built for his beloved wife, Phoebe. Phillip served as the President of the Pocahontas Company. 1895: Edward S. Baker moved to Bramwell and became the first principal of Bramwell High School and served for six years. He was also employed by the Bank of Bramwell. He later became a West Virginia State Senator from 1906-1910. 1896: Jairus Collins moved to Bramwell. He was rhe general manager for Louisville C&C and helped organize the Pocahontas Operator’s Association. He reportedly acquired properties for investments and several coal operations. 1899: Coal Baron, John Cooper passes away. Having made a fortune in the coal business he also served President of the Bank of Bramwell. His home was just outside Bramwell in Coopers, WV. 1902: Buckeye Coal & Coke built a home in Bramwell for general superintendent, J.C. Pack. The Bank of Bramwell built a home for J.B. Perry and his family. Perry was one of the bank’s first cashiers. The historic Perry House served as a Bed & Breakfast for many years. 1909: W.H. Thomas and his wife, Annie, started building their Revival Tudor style house in Bramwell. It was completed in three years at a cost of $95,000. Italian stone masons did the stonework on the house and retaining wall using stone found on the property. 1910: A fire that broke out in a pool room on Town of Bramwell Main Street that destroyed 21 buildings. Reconstruction of the town's business district began soon after the historic fire. 1910: The Bryant Pharmacy opened on Main Street at Christmas. Many local women lined up to buy the expensive Chanel #5 perfume. This historic pharmacy was reported to be the 3rd in the nation to stock this item. 1910: The son of coal baron John Cooper, Edward Cooper Sr. built his mansion on Bramwell's Main Street. The mansion featured the first copper roof in the United States. The golden bricks used on the house were hand-fired in Europe. A few feet away from the main house there is a building that housed a swimming pool. 1914: Colonel John D. Hewitt's widow, Katherine completed the Hewitt mansion. Colonel Hewitt was the first mayor of Bramwell. He had died in 1903. Katherine Hewitt decided to build a “Anne Hathaway Cottage.” The property also included a guest house/carriage house. The Hewitt House was the last mansion constructed by a coal baron. After Col. Hewitt died Katherine continued to manage the family coal mining business. 1923: A young 29 year old Dr. Homer Luttrell came to Bramwell to become the town doctor and served as the family doctor for hundreds of coal miners for 21 years. He left Bramwell in 1944. He lived to be 96 and practiced medicine in Pulaski, VA for over 40 more years. 1929: Bramwell Bank was jolted by the beginning of the Great Depression. 1932: Bank of Bramwell started the process of being disolved and established a means to pay off depositors over the next 50 years. Bank of Bramwell president, Isaac T. Mann, who had lost millions in the depression suffered a heart attack at the age of 68 and died in May 18, 1932. 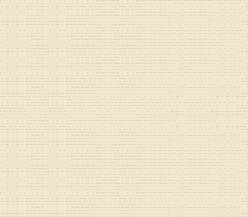 1933: Bank of Bramwell stockholders met to approve liquidation plans. Final liquidation was made and 100% returned to the creditors in 1958, having required a total of 25 years. 1933: Bramwell High School building was destroyed by fire and rebuilt by 1935. Bramwell Schools remained open for 108 years before closing in June 2004. The High School closed in 1992 and the Grade School closed in 2004. The school buildings were later sold at auction. 1935: Dwight W. McCormick became the principal of the new Bramwell High School that replaced the destroyed school building. Ada Blair Whitmore was in her 7th year teaching at BHS.